Thanks to Dr. Nasir Uddin, Aga Khan University Hospital (Pakistan), for contributing this case. To contribute a Case of the Week, follow the guidelines on our Case of the Week page. 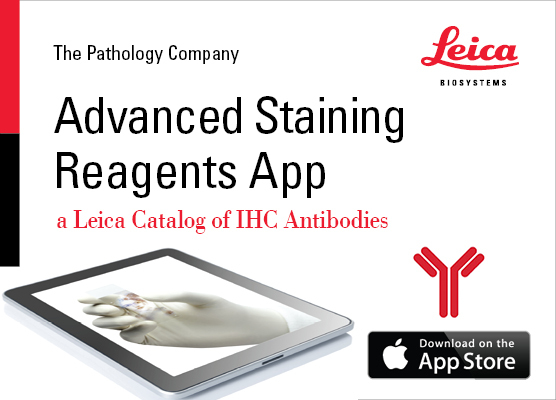 Leica Biosystems releases two new customer apps for Immunohistochemistry (IHC) Education and Reference for Path Lead and IHC Antibody Catalog. 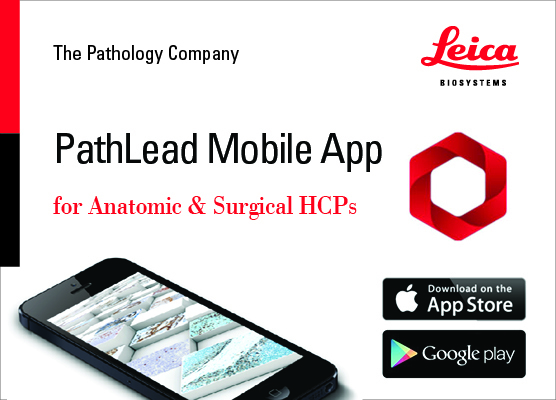 PathLead is a mobile educational tool and pathology resource application, designed for use by healthcare professionals in the field of surgical pathology and diagnostic immunohistochemistry (IHC). IHC Antibody Catalog is an application for Laboratory Managers and Pathologists looking for both routine and innovative IHC antibodies and consumables. Both are currently available for download at the Apple App Store. (1) There is now an easier way to post images on our Flickr page. Just email the pictures to part85keep@photos.flickr.com and send a CC to CommentsPathout@gmail.com. 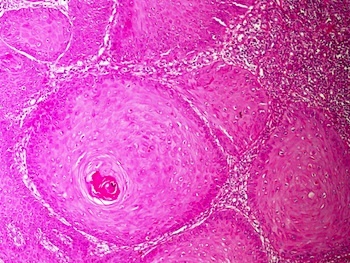 You can use the subject line to give the image a title and the body to add a description, which should include the diagnosis and the contributor's name. (2) The links to Webpathology.com do work, but we are in the process of updating the thumbnails, which may take some time since there are so many. (3) In May 2014, we had record traffic of 623,482 visits, with a daily record of 25,244 visits on May 14. (4) Our Feature page for June is Diagnostic Testing / Reagents, and highlights Advanced Cell Diagnostics, Inc. (ACD), bioTheranostics, Cell Marque, Leica Biosystems and Ventana Medical. It also contains an original short article, "Diagnostic Reagents: The Potential Role of microRNAs", by Jaleh Mansouri, M.D. (5) Visit our Updates page to see what topics have been revised based on reviews or new images. 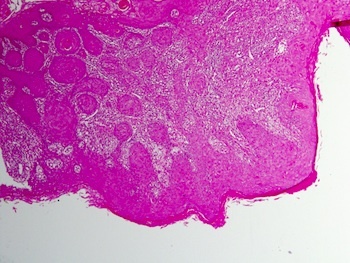 A 53 year old man presented with a chest wall "sebaceous cyst", which was excised. 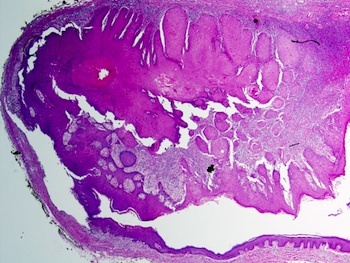 The gross specimen was 2.5 cm of excised skin with subcutaneous tissue containing a 1.5 cm cyst. 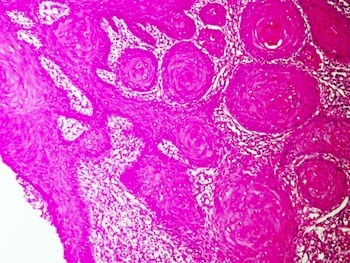 Epidermoid cysts are the most common cutaneous cysts, typically appearing on the face, scalp, neck, and trunk (see Skin-Nonmelanocytic tumors chapter, eMedicine). 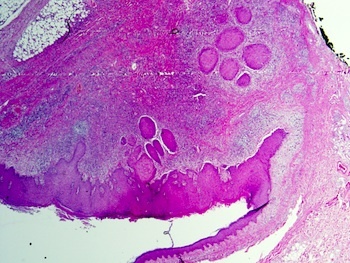 Most lesions originate from the follicular infundibulum, so the clinical term "sebaceous cyst" is inaccurate. 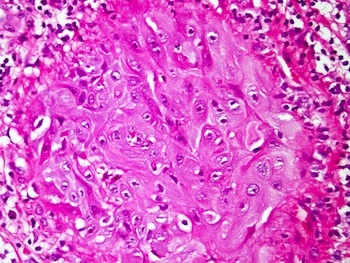 Histologically, these lesions are lined by keratinized epithelium with a distinct granular layer. 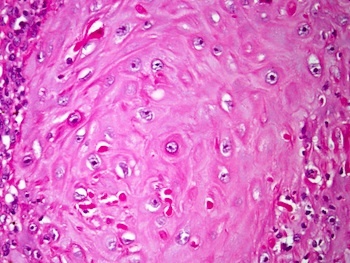 The cyst contains lamellated keratin but no calcification. 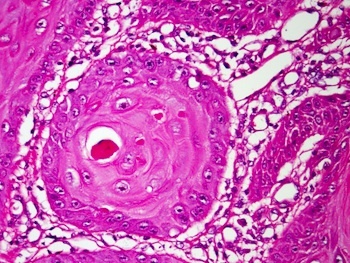 Although benign, premalignant and malignant lesions have been identified in their walls, often as incidental findings (J Plast Reconstr Aesthet Surg 2012;65:1267), illustrating the importance of routine histology in these lesions (Ann Acad Med Singapore 2000;29:757, N Am J Med Sci 2010;2:46). Treatment consists of excision, and possibly retinoids for chemoprevention (Dermatol Ther 2014;27:94).